The US dollar has spent much of 2017 consolidating from its December highs, when it peaked at a 10-month high of JPY 118.66. From languishing at near three-year lows of JPY 100, the dollar rallied following the November presidential election, bolstered by confidence in Trump’s campaign pledges to increase infrastructure spending and impose large tax cuts. Aside from sending the dollar soaring, the so-called ‘Trumpflation’ effect has also boosted commodity prices and equities, particularly among construction stocks, with many experts persuaded that Trump’s promised fiscal stimulus will lead to higher growth. 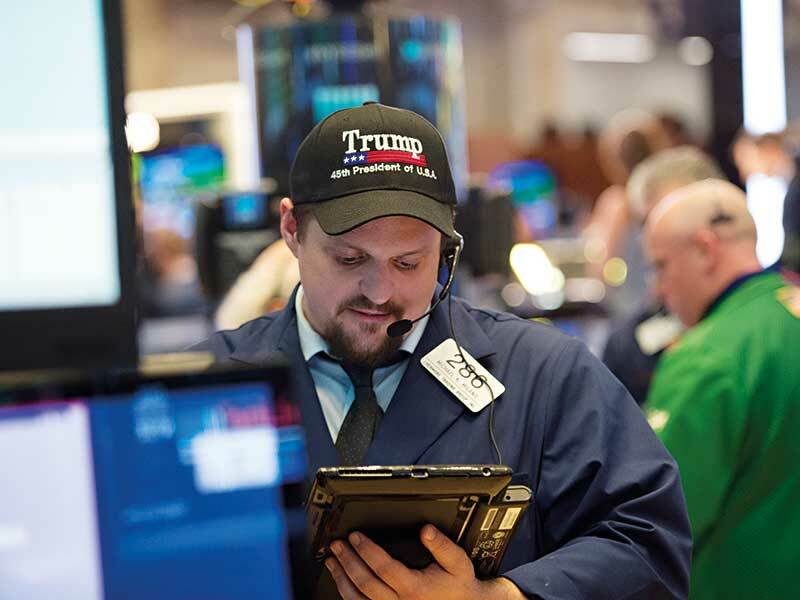 In a seeming vote of confidence in the new president, the Dow Jones Industrial Average and the S&P 500 both rose to record highs during the first quarter of this year. Moreover, government bond yields have increased as investors move funds away from fixed income assets and into pro-growth assets. The yield on 10-year US Treasury notes has also surged to a two-year high, as the market anticipates further interest rate rises from the US Federal Reserve. Despite this Trumpflation rally, however, the dollar is facing a new wave of challenges. With escalating geopolitical tensions and Republican Party infighting, the US currency may well struggle to recover its post-election value. The dollar rally first lost its fizz when the Trump administration showed signs of deviating from its campaign promises on infrastructure and tax policies. With disunity among Republican Party members and delays in confirming Trump’s full cabinet, many of the president’s campaign pledges took a back seat during his first few months in office. Perhaps most significantly, Trump’s first attempt at a revised healthcare bill failed to get the necessary backing in the House of Representatives, resulting in it being sensationally pulled. While later rectified, the defeat was not only a sign the new administration would have a hard time winning the support it needed from its own party, but it also fuelled doubts over whether tax cuts would ultimately prove feasible without any reductions in health spending. US Treasury Secretary Steven Mnuchin confirmed in an interview that the previously stated deadline of August for passing the tax reforms was looking unrealistic, and he expected the tax overhaul to happen towards the end of the year. Despite this revised outlook, however, Mnuchin promised the proposed tax cuts will be the largest instance of tax reform in the history of the US. After losing some 60 percent of its post-election gains, the US dollar now looks vulnerable to further depreciation, particularly amid low levels of consumer spending. Retail sales declined month-on-month in both February and March, contrary to certain optimistic consumer surveys. Inflation data has also given industry experts some cause for concern: the core Consumer Price Index fell for the first time since 2010 between February and March, while the Fed’s preferred gauge – the PCE price index – has been frozen between 1.6 and 1.8 percent since the latter half of 2016. Meanwhile, geopolitical tensions have also taken their toll on the dollar. In particular, North Korea’s nuclear ambitions and an increasingly strained relationship with Russia have dampened bullish sentiment for the US currency. While the dollar may be underperforming, gold has emerged as one of the best performing assets of 2017, bolstered by increased risk-aversion stemming from Trump’s confrontational stance on foreign policy. Gold prices hit a five-month high of $1,295 an ounce in April, with political uncertainty in Europe also contributing to the precious metal’s gains. Away from US shores, Trumpflation is also having a profound effect on various other currencies. Commodity-linked currencies, such as the Australian dollar, have benefited from a rally in the price of resources such as iron ore. As the country is the largest iron ore producer in the world, Australia’s currency performance is strongly tied to the commodity’s prospects. Along with the Canadian and New Zealand dollars, the Australian dollar outperformed all other major currencies in the first two months of the year. In fact, the Australian dollar advanced by an impressive 7.5 percent between January and March, as iron ore prices surged by more than 20 percent. On the opposite side of the world, the euro and the pound have both been dogged by uncertainty about the region’s economic and political stability following the UK’s decision to leave the EU last June. The Brexit bombshell gave fresh momentum to anti-establishment movements across Europe, which have been on the rise since the introduction of tough austerity measures following the 2008 global financial crisis. With millions of voters feeling alienated from mainstream politics, radical populist movements have made significant gains in the region. The euro had its first big test in March, when Geert Wilders’ far-right PVV Party threatened to disturb the political status quo during the Dutch general election. A last minute boost for Mark Rutte’s centre-right VDD Party brought great relief to many European leaders and kept the euro at a stable value. However, just one month later, this stability was threatened once again by the contentious French election. Notwithstanding a somewhat poor start to the year, the sterling is now enjoying a strong 2017. The British currency has been bolstered by added certainty over the country’s Brexit path, after Prime Minister Theresa May finally put pen to paper to invoke Article 50 on March 29. While the UK’s Brexit negotiations will certainly prove complex and lengthy, May’s conciliatory tone has so far helped to soothe market concerns over potential disputes between the UK and the EU. What’s more, the pound enjoyed a further boost following May’s surprise call for a snap election. With the ruling Conservative Party enjoying a 20-point lead in the polls a month prior to the election, investors at the time were hoping an increased Conservative majority in the House of Commons would allow Prime Minister May to pursue a definitive path for Brexit, free from opposition meddling in her preparations to leave the EU. While this no longer appears to be the case, sterling’s lift following the snap election announcement took the currency back above $1.28 for the first time since October 2016. While the euro and the pound have had a mostly positive start to 2017, their future performance will very much depend on how the current eurozone risks play out. Upcoming elections will determine the fate of the euro over the coming months, while the Brexit negotiation process will continue to shape the value of the pound. As for the dollar, its outlook will most likely be determined by the size and nature of Trump’s planned tax cuts and infrastructure spending, in addition to the wider influence of deregulation and the revision of trade agreements. However, with the impact of such measures unlikely to be felt until 2018, a bigger determinant of whether the dollar rally can be reignited is wage growth. The absence of wage pressure since the financial crisis has been holding US consumer prices down, even as the unemployment rate continues to fall. The jobless rate in the US fell to a 10-year low of 4.5 percent in March, but average hourly earnings eased to an annual rate of 2.7 percent. At present, low productivity growth is the main factor keeping wage growth at muted levels. The Federal Reserve has adopted a policy of very gradual rate increases, despite the US economy now being in its eighth year of expansion following the end of the Great Recession. With many sectors of the economy now beginning to report worker shortages, the Fed may well accelerate its pace of rate increases, acting before any fiscal stimulus kicks in. With further rate rises on the horizon, the dollar could well rally, bringing the JPY 120 level back within reach again. As we look to 2017 and beyond, a decline in Trumpflation could have a profound impact on currencies the world over. With geopolitical shifts continuing to reshape the global economy, the foreign exchange market faces a turbulent future.